LORDSHIP SALVATION is the false doctrine that a sinner MUST forsake a sinful lifestyle to be saved. In sharp contrast, the Bible, God's Word, teaches that a sinner's faith in Christ alone is sufficient for salvation. We are not saved by trying, but by trusting. Eternal life is a free gift, freely received by faith alone in Christ. I am a strong OPPONENT of Lordship Salvation. In fact, I hate the hellish lie of Lordship Salvation. If Jesus Christ is not the Lord and Master of your life, He is NOT your Saviour. ALL opponents of this doctrine DENY the Lord Jesus Christ and turn the grace of God into lasciviousness by saying saved people may live just like the world. Many of today's "soulwinner's" believe, and preach, that submitting to Jesus as Lord is optional. They say Jesus will be your Saviour while Satan is your Lord. That is not what the Bible says. Only the devil would want you to believe that. The blood of Jesus is so POWERFUL that it will give you a new mind. Read Romans with clear eyeballs and see for yourself. ACCUSATION #1: "If Jesus Christ is not the Lord and Master of your life, He is NOT your Saviour." MY RESPONSE: You can't support that statement with the Scriptures! 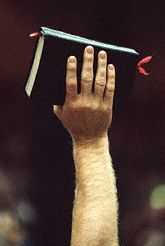 Lordship Salvationists interpret the word Lord to mean "Master," i.e., to surrender to Christ's will. However, the Biblical word for Lord is quite different, which is always the Greek word KURIOS, meaning "Supreme in Authority." Hence, to believe on Christ is to trust THE LORD. Every lost sinner who comes to Jesus Christ for salvation is coming the LORD, i.e., to God Almighty, for salvation. You don't make Jesus Lord, He is Lord. For Lordship Salvationists to make a distinction, and create an entirely new doctrine, which requires a person to make Christ the Master of his life to be saved—is damnable heresy! ACCUSATION #2: ALL opponents of this doctrine DENY the Lord Jesus Christ and turn the grace of God into lasciviousness by saying saved people may live just like the world. MY RESPONSE: That is a horrible lie! Did Abraham deny the Lord, when he simply "believed in the LORD; and he counted it to him for righteousness" in Genesis 15:6? Not at all? Romans 4:5 plainly states that we are saved WITHOUT WORKS. Abraham was justified solely by faith concerning his salvation. When James speaks of Abraham's faith being justified by works, he was speaking about the incident in Genesis 22 when Abraham offered up Isaac. This was 7 chapters LATER, after Abraham was saved in Genesis 15:6. James speaks of the FRUIT of Abraham's faith in James 2:21; BUT Paul speaks of the ROOT of Abraham's faith in Romans 4:3-5. Lordship Salvationists confuse the ROOT of Christian faith with the FRUIT (i.e., evidence) of that faith. To accuse all "opponents" of Lordship Salvation of condoning worldliness and sinful living is unfair. Nothing could be further from the truth. We do not believe that at all. The Bible does not give anyone God's permission to live in intentional sin (Romans 3:31; 6:15). The Bible teaches that if a person is genuinely saved that there should be some evidence (i.e., the "works" spoken of in James 2:18). However, this has nothing to do with salvation itself. Also, you CANNOT mandate such changes for salvation, otherwise you've corrupted the Gospel. Please do not misunderstand—You cannot tell how much fuel is in a car's gas tank by the sound of the horn; and you cannot determine if a person is saved by viewing their lifestyle. James speaks of works seen in the eyes of men, not God. True, a saved person should bring forth works of righteousness in their life, which are evidence of the indwelling Holy Spirit; HOWEVER, just because such works are not readily visible for others to see doesn't mean they are not saved. Following Jesus Christ is a matter of DISCIPLESHIP, and not SALVATION. Eternal life is a free gift (Romans 5:15; 6:23; Ephesians 2:8-10). Our churches are filled with morally upright people who are still hellbound in their sins and unbelief. Satan's greatest weapon is to con people into living the Christian life without ever being born-again. Living a consecrated life is not a part of saving-faith. Please read the beautiful words of Dr. John R. Rice exposing the heresy of Lordship Salvation. Carefully notice that Biblical repentance is NOT forsaking the act of sin, which is impossible for anyone. Nor is it the desire to forsake deliberate sinful bad habits. For anyone to say that a person MUST forsake their sinful behavior to be saved is heresy, because eternal life is a gift, which you simply take. Please read, The Hypocrisy of the Critics of Eternal Security. So to clarify. I am an opponent of the Lordship Salvation heresy. I do NOT believe that a believer may live like the world without consequences. Not at all. However, just because believers struggle with sin doesn't mean they're not saved (Romans 7:14-25). As believers we are commanded to walk in the Spirit, but carefully notice the Words of Galatians 5:25... "If we live in the Spirit, let us also walk in the Spirit." It is abundantly clear from this Scripture that it is possible to LIVE in Christ's Spirit (i.e., to be saved), and yet fail to WALK in Christ's Spirit (i.e., live for the Lord). Do some genuine believers live like the world? Yes, of course; BUT, Hebrews 12:8 tells us the big difference between a worldly heathen and a worldly believer... "But if ye be without chastisement, whereof all are partakers, then are ye bastards, and not sons." No believer can live in sin and truly be happy. God clearly states in Hebrews 12:8 that He will CHASTISE and SCOURGE the believer. The Holy Spirit will convict a backslider, and that is an important word—backslider (Proverb 14:14). Lordship Salvationists DON'T allow for a Christian to backslide. As far as they're concerning, a backslidden believer is no believer at all, and that's not Biblical. The Word of God gives us numerous references to heroes of the faith who backslid into horrible sin (such as king David who committed adultery and murder). ACCUSATION #3: Many of today's "soulwinner's" believe, and preach, that submitting to Jesus as Lord is optional. They say Jesus will be your Saviour while Satan is your Lord. That is not what the Bible says. Only the devil would want you to believe that. MY RESPONSE: Again, this flawed mentality leaves absolutely no allowance for a believer to backslide. The author of the preceding quote keeps alleging that Satan is the Lord of anyone who doesn't commit their life to Christ at the time of salvation, which is extreme and ridiculous to say the least. 1st Peter 2:2 speaks of growing in the milk of the Word. A new believer must be taught and mentored if they are to live for the Lord. Like it or not, there is an ongoing raging battle in EVERY believer between the sinful flesh and the Spirit of God (Romans 7:14-25; James 4:1). Even the Apostle Paul said in Romans 7:19, "For the good that I would I do not: but the evil which I would not, that I do." Now why would the Apostle Paul DO EVIL if Jesus were his Lord? Hmmm? This Scripture alone proves the ignorance and hypocrisy of the proponents of the Lordship Salvation heresy. ACCUSATION #4: The blood of Jesus is so POWERFUL that it will give you a new mind. Read Romans with clear eyeballs and see for yourself. MY RESPONSE: Yes, a new mind; but not a new flesh! The Apostle Paul states in Romans 7:24,25... "O wretched man that I am! who shall deliver me from the body of this death? I thank God through Jesus Christ our Lord. So then with the mind I myself serve the law of God; but with the flesh the law of sin." Proponents of Lordship Salvation are woefully blinded to the fact that every believer still has to contend with the carnal flesh. Oftentimes, as seen repeatedly from Genesis to Revelation, God's children falter. Does not Proverb 24:16 declare... "For a just man falleth seven times, and riseth up again: but the wicked shall fall into mischief"? Christians do falter in their faith at times. At best the Christian life is a rollercoaster. It was John the Baptist, whom Jesus called the greatest born amongst women (Matthew 11:11), who told his disciples to go ask Jesus... "Art thou he that should come, or do we look for another?" (Matthew 11:3). John became so discouraged in prison that he questioned if Jesus were truly the Messiah. What do you think the Lordship Salvation hypocrites would have said about John the Baptist? Lordship Salvationists are the hypocritical religious Pharisees of our time. We read in 2nd Timothy 4:10 that Demas forsook Paul, having loved this present world. Yet, we learn in Philemon 1:24 that a few years earlier Demas was a fellow-labourer with the Apostle Paul in his ministry. Demas was saved, but backslidden into the world. WE DO NOT BELIEVE THAT A PERSON MUST REPENT OF ALL OF HIS OR HER SINS TO BE SAVED. That is certainly not something we teach or lean toward, and that is not something we have ever stated in any article. In fact, I have plainly stated that I do not believe that. It would be impossible to "repent of all your sins." I have been saved for almost 24 years, and I still have not repented of all my sins! Note on David Cloud: Although I fully agree with David Cloud's statements above, but he does teach his own variation (ANOTHER GOSPEL) of the heresy. Please read, A Dangerous teaching in Fundamentalism. Are Opponents of Lordship Salvation Antinomians? ANTINOMIAN, n. One of a sect who maintain, that, under the gospel dispensation, the law is of no use or obligation; or who hold doctrines which supersede the necessity of good works and a virtuous life. This sect originated with John Agricola about the year 1538. ANTIMONITE, n. One who pays no regard to the law, or to good works. ANTINOMIAN, a. [Gr. against, and law.] Against law; pertaining to the Antinomians. ANTINOMIANISM, n. The tenets of Antinomians. Are opponents of Lordship Salvation antinomians? No, absolutely not! Opponents of the Lordship Salvation heresy are not Antinomians! I DON'T AGREE WITH ANTINOMIANISM. It is a false doctrine! I DO believe that Christians are under obligation from God to obey His laws and ethics, BUT NOT AS PART OF THE PLAN OF SALVATION!!! Romans 3:31, “Do we then make void the law through faith? God Forbid: Yea, We Establish the Law.” That's all I'm teaching! Every born-again believer is obligated to obey and fulfil the law, not to be saved, but because we are saved. Also see Romans 6:15. Although the believer in Christ is freed from the CURSE of the Law, we are nevertheless expected to obey the COMMAND of the Law. Jesus said in John 15:14, "If ye love me, keep my commandments." No believer has God's permission to sin. 2nd Corinthians 5:10 plainly states, "For we must all appear before the judgment seat of Christ; that every one may receive the things done in his body, according to that he hath done, whether it be good or bad." There will be a separate judgment in Heaven just for believers, which proves that a believer cannot lose salvation because of sin. If sinful believers went to Hell, then there would not be any need for a separate judgment for believers who sin. 1st Corinthians 3:15 tells us that some believers will escape Hell "as by fire." In other words, they will receive no rewards in Heaven. This clearly refutes the Charismatic heresy that salvation can be lost. If that were true, then how could a believer, who lived so awful as to receive NO REWARDS in Heaven, still go to Heaven? Oh! The folly of those today who propagate the Lordship Salvation heresy. Their accusation against Bible-believing Christians that we make void the Law is absurd and certainly untrue. Just because a Christian goes into sin does not mean that they have chosen Satan as their lord. How ridiculous! Did king David make Satan his lord when he deliberately committed adultery and murder? Did Peter make Satan his lord when he denied Christ? Such accusations are childish. The truth is that every believer struggles with the sin-nature. As my pastor Dr. Jack Hyles used to say... "We can walk in the Spirit at any given moment if we so choose; but we won't always walk in the Spirit because of our sin-nature." God has given us the ability to escape temptation (1st Corinthians 10:13); but as sinners we won't always do that. Lordship Salvationists act like they are without sin, but they are saturated with sins, especially the sin of hypocrisy.